July 2004 required ISPS and MTSA security training. Employees can learn while still on the job, for a fraction of the cost associated with seminar and academy-based programs. Facilitator's Guide with lesson plans and test questions, over 12 hours of detailed Video/DVD media instruction, and the means to have third party validation and certification of employee training records. Organization (IMO) to enhance mar- itime security in response to the increasing threat from terrorism and piracy. After July l, 2004. most deep- sea passenger and cargo ships must be fitted with a device that can send an alert message containing the ship's ID and position whenever the ship is under threat or has been compromised. The distress message must be activated covertly from a switch on the naviga- tion bridge or other shipboard location, and transmitted only to the designated authority without being received on other ships or raising an alarm on the ship under attack. The new SOLAS resolution 6 states that the Ship Security Alert System shall provide ships with two alarm but- tons, which can be activated in case of a piracy or terrorist attack. The alarm is a covert signal, which will have no sound and no flashing lights so that it is in no way obvious to any intruders on board the ship. 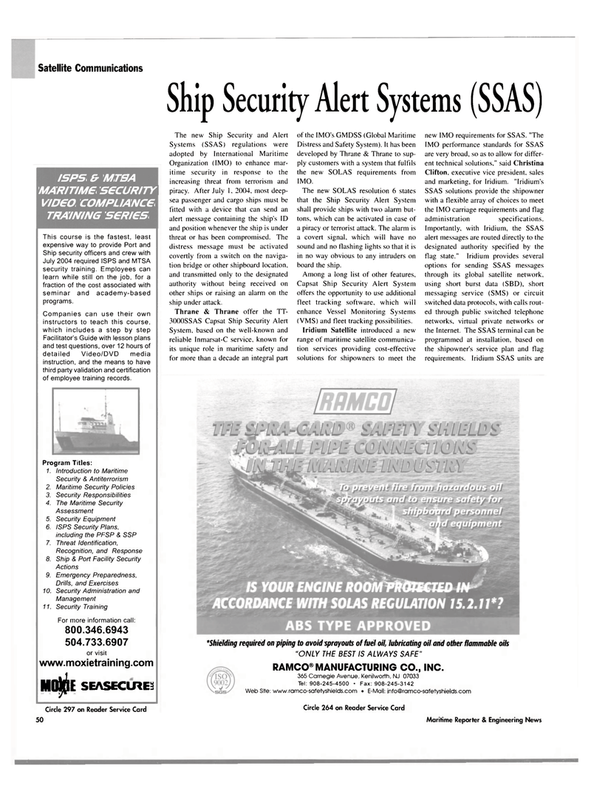 Capsat Ship Security Alert System offers the opportunity to use additional fleet tracking software, which will enhance Vessel Monitoring Systems (VMS) and fleet tracking possibilities. SSAS solutions provide the shipowner with a flexible array of choices to meet the IMO carriage requirements and flag administration specifications. Importantly, with Iridium, the SSAS alert messages are routed directly to the designated authority specified by the flag state." Iridium provides several options for sending SSAS messages through its global satellite network, using short burst data (SBD), short messaging service (SMS) or circuit switched data protocols, with calls rout- ed through public switched telephone networks, virtual private networks or the Internet. The SSAS terminal can be programmed at installation, based on the shipowner's service plan and flag requirements. Iridium SSAS units are *Shielding required on piping to avoid spray outs of fuel oil, lubricating oil and other flammable oils "ONLY THE BEST IS ALWAYS SAFE"